Objectives: Mount & connect the set up of microstrip patch antenna to compute practical parameters & compare it with the standard parameters. A patch antenna is a narrowband, wide-beam antenna fabricated by etching the antenna element pattern in metal trace bonded to an insulating dielectric substrate, such as a printed circuit board, with a continuous metal layer bonded to the opposite side of the substrate which forms a ground plane. Common microstrip antenna shapes are square, rectangular, circular and elliptical, but any continuous shape is possible. Some patch antennas do not use a dielectric substrate and instead made of a metal patch mounted above a ground plane using dielectric spacers; the resulting structure is less rugged but has a wider bandwidth. Because such antennas have a very low profile, are mechanically rugged and can be shaped to conform to the curving skin of a vehicle, they are often mounted on the exterior of aircraft and spacecraft, or are incorporated into mobile radio communications devices. Microstrip antennas are relatively inexpensive to manufacture and design because of the simple 2-dimensional physical geometry. They are usually employed at UHF and higher frequencies because the size of the antenna is directly tied to the wavelength at the resonant frequency. A single patch antenna provides a maximum directive gain of around 6-9 dBi. It is relatively easy to print an array of patches on a single (large) substrate using lithographic techniques. Patch arrays can provide much higher gains than a single patch at little additional cost; matching and phase adjustment can be performed with printed microstrip feed structures, again in the same operations that form the radiating patches. The ability to create high gain arrays in a low-profile antenna is one reason that patch arrays are common on airplanes and in other military applications. 1) Mount the Microstrip Patch antenna on receiver stand of antenna trainer kit; connect a coaxial cable between antenna and input section of transreceiver meter. 2) Mount Yagi-Uda antenna on stand of transmitter stand of antenna trainer kit, connect a coaxial cable between antenna and output section of transreceiver meter. 5) Beamwidth can be calculated by observing 2D radiation pattern. The Microstrip Patch antenna was analyzed on the antenna trainer kit. Field Strength of various angle were obtained and radiation pattern were plotted for same. Microstrip patch antennas are used for which frequency range? List the applications of microstrip patch antenna? What is the main drawback of microstrip patch antenna? Which type of polarization is achieved with microstrip patch antenna? How to increase bandwidth of microstrip patch antenna? 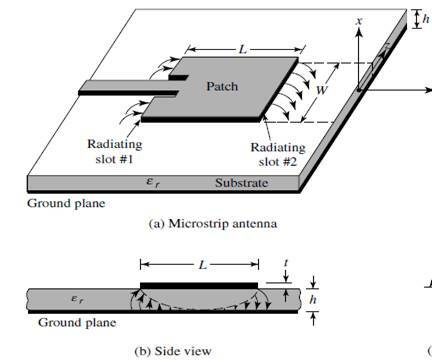 How to increase the directivity of microstrip patch antenna? Which different types of shapes can be used for the patch of microstrip patch antenna? Which shape is generally preferred?